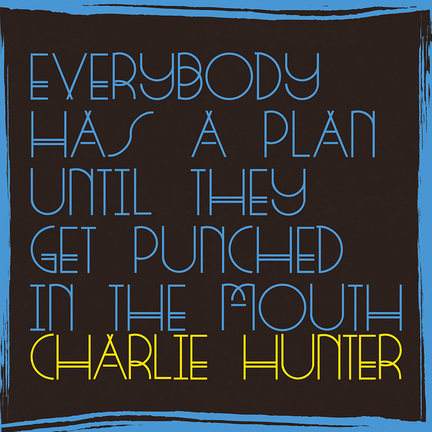 Charlie Hunter’s album and song titles-including this record’s name, taken from something Mike Tyson uttered-aren’t the only off-kilter aspects of his music. And I mean that in the best sense of the term, as in unpredictable and often delightfully so. The San Francisco-bred guitarist-bassist has seen his career travel some unexpected pathways since the mid-1990s, when he emerged as the guy known for applying his unique hybrid instrument to jazz-funk settings in his own groups and with the band T.J. Kirk. For his latest recording, he leads a quartet featuring three highly individualistic players-drummer Bobby Previte and trombonist Curtis Fowlkes, both of whom have collaborated with Hunter previously, and newcomer Kirk Knuffke on cornet. Everybody might fairly be called groove music, as infectious laidback rhythms mostly drive these 10 tracks, recorded live sans overdubs at a studio in Hudson, N.Y. The entire affair is shaded in the blues, most prominently sounded on Big Bill Broonzy’s “Big Bill’s Blues,” which thrives on the foot-stomping, gutbucket propulsion of the leader and Previte and is highlighted by the New Orleans-style collective soloing of the horn men. NOLA-style R&B-punched with unexpected breaks-flavors “No Money, No Honey” and “The Guys. Get. Shirts.,” which wouldn’t have been out of place as an instrumental for The Band. The title track launches the set with brass-choir-style harmonies leading into a swaggering jazzy blues walk. “Leave Him Lay” gets its kicks through an unconventional trombone melody and a sticky shuffle alternated with a modified march feel. Rhumba rhythms center the steamy “Latin for Travelers,” spiked with unaccompanied fills for the horns. Overall a late-night vibe infuses the proceedings on this atmospheric, noir-tinted gem.